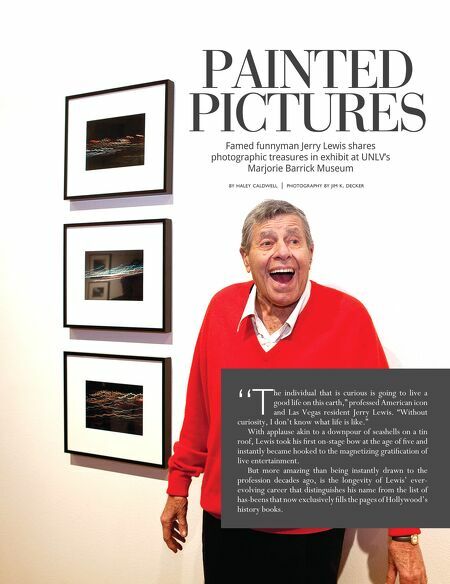 55 july-august 2014 | luxury las vegas by haley caldwell | photography by jim k. decker Famed funnyman Jerry Lewis shares photographic treasures in exhibit at UNLV's Marjorie Barrick Museum PAINTED PICTURES "T he individual that is curious is going to live a good life on this earth," professed American icon and Las Vegas resident Jerry Lewis. "Without curiosity, I don't know what life is like." With applause akin to a downpour of seashells on a tin roof, Lewis took his first on-stage bow at the age of five and instantly became hooked to the magnetizing gratification of live entertainment. But more amazing than being instantly drawn to the profession decades ago, is the longevity of Lewis' ever- evolving career that distinguishes his name from the list of has-beens that now exclusively fills the pages of Hollywood's history books.